The first thing I do when preparing to repot is to gather my supplies and tools. Potting medium, scissors/razor blade, a knife, cinnamon, peroxide, a collander (to drain medium), a large bowl, a lighter/torch, and a couple different sizes of pots. If I am potting with bark, I will soak it in hot water with some dish soap for at least 6 hours or more before potting. I then rinse the bark thoroughly. Carefully remove the plant from the pot. With a plastic pot I gently squeeze the pot until it is loosened, and pull the plant from the pot. With ceramic or clay, I gently run a clean knife around the inside of the pot to loosen the roots. If using the knife to loosen the roots doesn't work, I wrap the pot in a towel, and break it with a hammer. If there is an old spike attached, I leave it on the plant, and use it like a handle to hold the plant. I then put the plant in a large bowl and fill the bowl with tepid water, and 3 drops of Superthrive. After the plant has soaked for about 20 min. 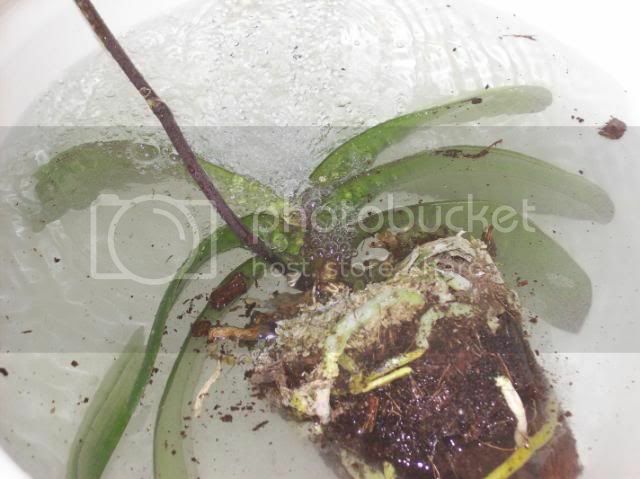 or more, I begin to loosen the medium from between the roots while the plant is still in the water. When I feel I have gotten enough of the medium out, I strain the water into a collander, and throw away the old medium. I then tease all of the old medium out that I can with my hands, or by rinsing with the sprayer. Last edited by brookn; 09-27-2008 at 07:15 PM. I then sit down with tweezers, and scissors. I remove the old medium, and any mushy or dead roots. I soak the plant and roots again to clean out anything I have missed. Then I soak with peroxide if there is a concern with rot, followed by cinnamon on the cut ends. I get the pot that the plant will be in, and check to see how the plant fits down into the pot. 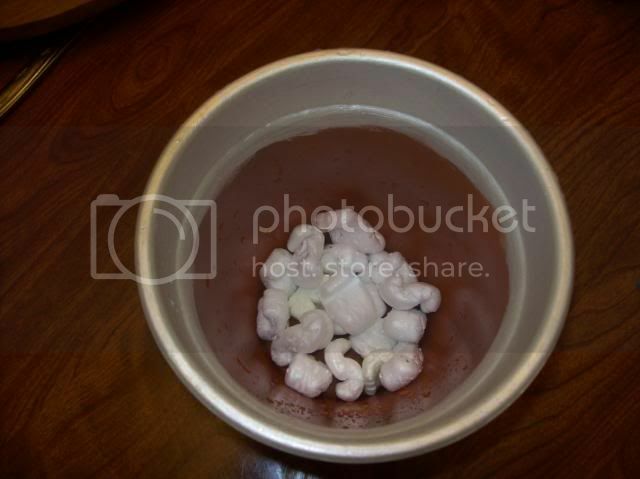 I then take the pot and fill the bottom with styrofoam peanuts. I top that with a layer of the medium that I am going to use. I then hold the plant in the pot, and begin to pour the medium in, shaking and tapping the pot to settle it in. Last edited by brookn; 09-27-2008 at 09:02 PM. How did you pick which medium to use. If she first had sphag should one stick with sphag, or would it be ok to switch to fir bark without a problem? It really depends...your climate, if you're able to control the wetness of the sphag etc. and preference. Some people hate using sphag for Phals and others have success with it. 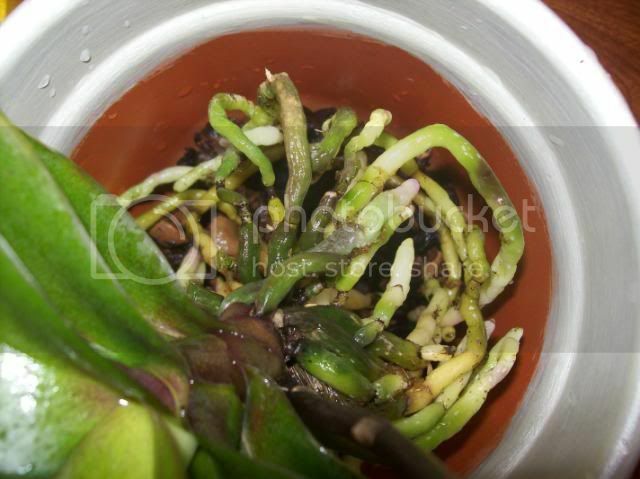 Most people use a bark mix for phals for the drainage; you just have to water a bit more. I use a coir mix myself and have loved the change; it retains enough water, but not too much and I don't have to water as often. My phals love it! Hmmm, what is coir mix? This sounds a bit complicated and likely something I would have to order. Would you know where I could order it or explain a bit more? When sterelizing tools, is there a certain ratio of bleach to alcohol to use? And how should I sterlize the pot? Can I just use the bleach/alcohol mix? Almost time for my repot....yikes!! 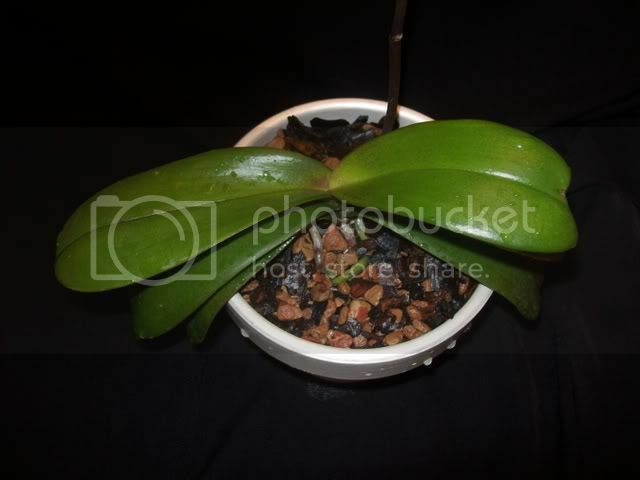 Hi, I use sphag for Phals that go into pots under 6". This plant went into a 6" pot, so I used my bark mix. I was hoping to put it into a 4" pot again with sphag, it would not fit, and I only had a 6", and the roots went to the bottom of the pot. So the pot was a little big, but not by much. I edited this a bit, because when I posted this a.m., I was in a rush to get to work. I think I have covered everything now. I will add potting a Phal into sphag to it, or make another post when I repot another Phal that I know is going into sphag, in a couple of weeks. I would think that alcohol or bleach would work fine for sterilization. I use soapy water to clean my blades, and use a lighter to then heat them. Last edited by brookn; 09-27-2008 at 07:18 PM. I love the way you explained it by the step-by-step process! I just rip them out of the pot, shake off all the old mix. strip and clean up the roots and shove it into the next size pot. I am going to re-pot my Phallies from bark mix to the coco nuggets this year to give them a bit more moisture and cut down on the watering. Thanks again for the wonderful photos. Last edited by Ron; 09-28-2008 at 05:29 AM. this thread has also be made "Sticky"
http://www.orchidgeeks.com/forum/orc...and-media.html Look here for more information about coir. Button and Janet thanks as well. Ron that's funny. It's easy to be a bit compulsive when you don't have a lot of plants. When I have the number of plants that you have I'll probably do the same thing. One of the reason I originally joined the Orchid Geeks was to see how others grew and repotted their orchids. Especially Phallie's as I only started to grow them in the last couple of years. I enjoyed your photos so much, been in the orchid house all day watering and fertilizing. There is a new posting called "Calling all Phal Experts", with pictures of my phal after her repot! It looks like the infection has spread to the crown, but I can't tell how bad it is.Or what the infection is?? I guess it might not be crown rot, because it didn't start from the top down? Yikes! Calling all Orchid Geek doctors for their diagnosis!! What a great tutorial - your pictures and written description are concise and to the point without too much verbage. Great job! That is a wonderful tutorial and very helpful. Having seen the comments of other readers, I was wondering about changing the potting medium for my Phals. The shop-sold bark medium that I bought tends to dry very quickly and maybe sphagnum would be better in my house. If I used moss when I next pot, how would I recognise if the plants were not so happy? Or, is it better to stick with the bark and just water often? Hi, it sounds like your bark is not retaining enough moisture, was it soaked before using it? I think that the size of the Phal determines whether it needs sphag or not. Plants in under 6" pots I prefer sphag, 6" pots and above I go with bark. Please understand that using sphag is not for everyone, because if you are not used to the medium and over water, you will rot your roots much faster than by using bark. I use the skewer method to determine when to water, and I soak water the plants (esp. the ones in bark) once or twice a month. I just set them in the sink, and fill with water up to the pot rims, and let the plants soak for about 20 or 30 min. Thanks Brooke with the e!!! Many thanks brookn. My plants are only in 4" pots at present, and yes, the bark was soaked before use. Yes, I also soak the pots in a tub of water and allow to drain well afterwards. This is probably a very dumb question, but what is the 'skewer method'? What is meant by tepid water? Distilled? 1. Hydrogen Peroxide, like the one you buy just from the local grocery? 2. After soaking do you rinse it? Must you let it dry before repotting? Same for the bark? 3. What if it has a stem after cutting back? Do you need to soak that as well? or just spray it? 4. The peanuts you mention. Do I soak these too? Where can I find these? Do they get moldy or attract bugs? 5. Can I use just glass vases for the Phanaelopsis? or must it be in a container inside the glass vase? Neither warm nor cold, lukewarm. I generally use tap water. Yes the very same that you get at the store. I am not sure what you mean here, could you elaborate? Thanks. The stem is what most of us refer to as a spike, or inflorescence, as you can see from my tutorial, my plant has a spent inflorescence, it's done blooming, if you reread carefully you'll see at the end that I recommend cutting it off as close to the plant as possible without damaging the plant. I usually dab a little cinnamon on the cut end. These are simply styrofoam packing peanuts, I test them to see if they soak up water or become mushy, I use the ones that float and don't soak up any water. These are to help provide airflow to the roots of the plant, they should not mold or attract bugs. I would only use a glass vase if it had holes for airflow, most orchids do not like their roots sopping wet, Phals are epiphytes which are plants that grow clinging to trees and such. They do not enjoy their roots standing in old water for long periods, and they really enjoy their roots getting some air. Putting the container inside the glass vase might work, as long as the roots are still getting air and not sitting in water. I saw your how to pics and noticed how you soaked and then repotted with the flower still wet. I thought maybe you had to let that dry first. After washing with hydrogen peroxide do you rinse afterwards? Thanks for answered questions! This all depends upon if the roots need the peroxide, I usually only do this if there are a lot of rotten roots. You can rinse the peroxide off or leave it, it doesn't matter either way. The plant above I did not soak in the peroxide, as it's roots were healthy. Thanks Brookn this is a great thread. what kind of pots do you use plastic or ceramic? 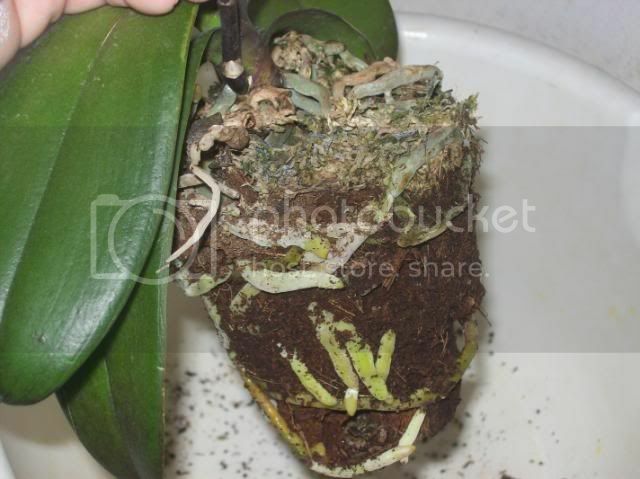 I was thinking that sphag and plastic pots are bad combination for phals, because moss get really wet and is tightly packed and the wholes are only at the bottom, so normally I move my phals in the clay pots and ask my husband to drill bunch of wholes in them. how do you pick the right size pot for the phal? Hi I prefer to use clay pots, especially with sphag, but I do have some plants in sphag with plastic. It's all about how you use it, and how comfortable you are using it. I have not had time to do the sphag tutorial, I just finished my classes for the semester, and had to get Xmas out of the way. I am glazing the pot tonight for a Phal going into sphag and will try to get a tutorial up this weekend. I pick the right pot for a Phal by choosing a couple before the repot that I think will work, and after the roots are all cleaned up, I fit them down into the pot to see if there is enough room for them. I tend to over pot my phals sometimes, preferring to put them into a bit of a larger pot and encourage lots of root and leaf growth before trying to get them to spike. I like big fat roots almost as much as I like blooms. I would not recommend this for everyone, and I know that some members will completely disagree with me, preferring to pot them more tightly into smaller pots. brookn - I agree with you. 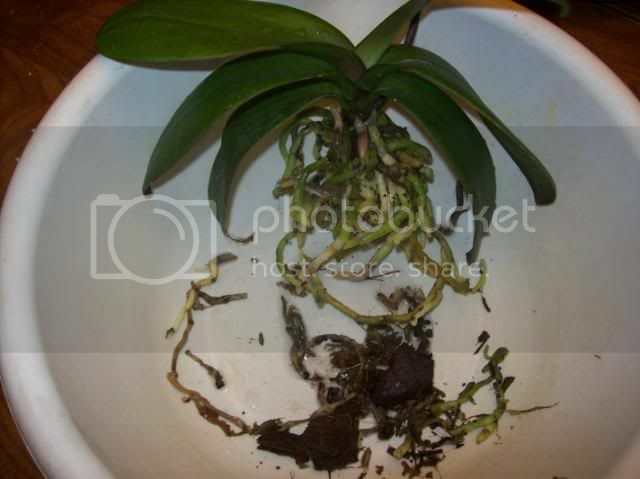 Since switching all my Phals to Sphagnum, I find that the roots will grow to fit the pot in just a few months. I can't wait to see your Phal in sphag tutorial. No one ever showed me how to repot in sphag and I'd like to compare notes. I don't know much about this, but I have several Phals around my apartment and the one with just a layer of sphag over the top of it is definitely the happiest. It has a medium bark mix underneath, and it seems to like that combo! I've been thinking about adding a layer of sphag over the bark on some of my other phals..... what do u think? ..... what do u think? I think that having a phal potted in bark with a little sphag on top and having a phal potted in sphag are two very, very different things. With the first, the one potted in bark with sphag on top, the excess water can still drain away and the sphag on top just holds in a little more moisture making the bark slower to dry out. With the second, the one potted entirely in sphag, there's not much drainage, especially if the sphag is packed tight, and water is held right at the roots and not allowed to drain away. hmm Melissa you just gave me an idea to eplore during summer, maybe i should put shpag over bark on my phals so the bark doesn't dry out as fast, because in our heat bark in clay pots dry out very very fast. I think being outside last summer for the first time for my phals did more bad then good, because I didn't adjust well to watering change. yeah i have a couple of plants that seem to dry out quickly in the florida sun, and im thinking about adding some sphag over the top layer of bark...... i hope it works for u! Bob I do agree with you, the summers here are quite humid, so I end up watering the plants in sphag more in the winter. I compare our summers to Florida weather, feels like you are breathing water. The thing for everyone else to remember with sphag, is that it is like a sponge, so moisture does sit around the roots. The trick with it is to pack it light, but just enough that the plant will remain in the pot if you turn it upside down. When I pot a plant with sphag I tuck the sphag around the plant and into the pot, I never pack it down with my fingers. I will post the repot probably Sunday. Melissa, I have my Neo with a layer of sphag over the bark, this helps to retain some moisture. Sphag alone was not working for them. The only drawback that I can see is that I can't dig around to see the roots as easily without messing up the sphag or mixing it into the bark. I like to be able to move the medium on my plants to see what the roots are doing. I am a brand new orchid owner of a beautiful Phal and I have a question. My orchid's root system looks just like this but it is still in the blooming process. I still have several buds and many flowers. Do I wait until it stops blooming to repot? Thanks in advance! of my phals. thanks for sharing, learned a lot from this. I was about to ask how to go about doing this but now I don't have to. Thanks so much! THANK YOU SO much for the time and effort to put this together!!! Yesterday, I re-poted my Phal following your steps and it wasn't as hard as I had imagined! Thanks again. Thank you for this! I took in an abused Phal from my friend whose roommate up and left. They had left it out in full sun (it's very sun-burnt) and half of it's root are dead, yet somehow it's still blooming!? Crazy! Anyway there was NO MEDIUM whatsoever left in the pot so I re-potted it today using your tutorial. I hope it makes it! If it does I'll post pics soon! Thank you, this was very helpful. Great pics with concise, easy to understand instructions. Way to go! Just a quick update. It's only been several days since I plated the abused Phal and it's already MUCH happier! The leaves are turning green again and aren't paper thin, they're starting to stiffen and not droop on the countertop. I am amazed! I was surprised at how easy it was to do to. 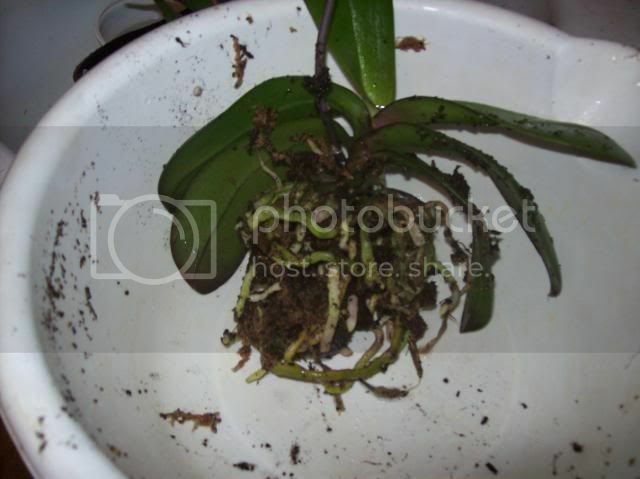 Thank you so much for helping me save an orchid that deserves a better life! Thank you ever so much, brookn, for your awesome, incredibly instructive post. I will certainly follow the instructions to the letter when I repot my phal. Only one question: can I repot while the phal is in bloom? The reason I want to do it is that the medium it's planted in is constantly wet; it has never really dried out and I'm afraid the phal's roots will rot if this situation continues. The pot is clear plastic with one drainage hole. Most phals don't seem to mind if you repot while in bloom. I did with mine and had no problems. It is always better to save the plant rather then the flowers. You don't want it to start dying because you waited for the flowers to be done. So when there is root rot, soak in pure peroxide? or do you water it down? and how long do you let it soak? Thank you PhalNewbie89 for your input. Yeah, I've heard that you can repot phals in bloom but that they will lose the flowers quickly because of the stress. However it is indeed true that it is better to save the plant than the flowers. Problem is that mine looks absolutely gorgeous right now; it has 11 flowers down a perfectly arched spike. If I can figure out how to attach a pic, I'll do it. Yard, I am a newb as well but what I have read often is cut away the bad roots and if possible put some cinnamon on the cut tips. I have heard some things about peroxide but I can't remember if they said to soak or put some on it so maybe someone else will leave some input. Thanks a bunch for that great step by step guide!!! This is a great thread. Love the pics! GREAT THREAD!! Was just about to ask a question about repotting but all info here! I am thinking of repotting my phal in the next couple of weeks following advice on another thread and will let you know how I get on! The plant has a good strong spike on it at the moment but would rather save the plant than any flowers as it hasn't been repotted for three years. Think it will be a weekend job though so i am not rushing and can do it properly and get the right stuff and most importantly need to find a new pot! What in the world is the cinnamon for? Do new pots need to be sterilized? I am planning to re-pot my phalaenopsis in the next few weeks, and I just found a new unglazed clay pot at my local greenhouse. I have read about sterilizing the tools I use to trim the roots, but I'm wondering if I should do anything with the pot? It's a good idea, and you certainly should if you're reusing an old pot. I dunno if it's strictly necessary if you're using a brand new one. I have bleached out old pots and found all sorts of nasties (including halves of dead ) so you might want to just to be extra safe from virii. Just be sure to rinse well if you use bleach. When I reuse a pot I give a good squirt of Clorox Cleanup then wash it out at the kitchen sink. I don't sterilize my "tools," I use the clippers and such as needed. I decided it was "extra" effort and didn't matter. They make it for the most part either way. I see there is a lot of controversy about the use of sphag and chips, and I noticed my first mistake I made on the repotting of my Orchids, I didn't soak the chips, that could be the reason why my new 3 catts dried out, however!! in my bigger phals I repotted in 4 inch pots, seemed to be plenty of room, I put a layer of sphag, then chips, another sphag layer, then more chips then topped it off with a green moss... would the sphag layers help hold water? Can or should I still soak even though there all ready repotted? That wouldn't be my method or choice of media either, but I can imagine how it could work OK for you. As you have noted, there are a lot of potential medias and combinations thereof that can work - depends upon the environmental conditions (including where in the world you live), types of pots used, and what kind of caretaker you are. Any time bark is used, if not presoaked I recommend a combination soak/water at each upcoming watering period for as long as it takes for the bark to begin to absorb and retain moisture. Since you have used a combination sphag/bark it may or may not be necessary or take as many applications. If you cannot be certain it may be advantageous to use a bamboo skewer for awhile to see how well it is retaining moisture in the middle of your pot. Good luck! what was that medium he used after the styrofoam peanuts, it looked like burnt chips or charcoal? Hey everyone.. I have a few questions about the phals I just bought & what you guys think about them. I have some pics attached below so u can get a better idea of what I am talking about. First off, I bought 3 phals from whole foods. The come in clear plastic pots(which I love since I can see whats going on in there) They all have spikes right now, and 2 are still opening up new flowers. However, 2 of them have roots that are trying to grow OUT of the pot. They are planted in sphag and what appears to be some other type of moss that I am unfamiliar with. 1 of them-the water drains TERRIBLY. I watered it last week & the water took a good couple minutes to even penetrate the medium. The water did eventually pass through, but I am worried that the moss is packed too tightly. The others are still moist so I did not water them yet. I just checked the one I did water & it is still very moist inside the pot. Do you think they all need to be repotted? I also think that they have not been repotted in a while because I saw some fungus gnats, and I heard that fungus gnats love decomposing medium. I know you shouldnt repot while a plant is spiking, but if you guys think they need to be repotted, I will do so as soon as they are done spiking. Also, when I do repot, I do not feel comfortable with using straight sphag, as it seems to stay moist FOREVER. I have heard a lot of people mix in styrofoam peanuts. I was planning on mixing sphag, styrofoam, and maybe a little bark. Does this sound like an ok combination?? as for the pics-the last 3 are of the same phal, just turned around. The other 2 pics are of the other 2..
Those roots look great! If you are having problems with water draining, then the medium may be packed too tight. I repotted my phal when it was in spike and it did just fine. You also do not have to use sphag, I use better gro bark for orchids. I like it, I found it at Lowes. Thanks...I dont know where I heard that about not repotting if the plant is spiking. Since they seem fine for now, I think I will wait to repot them just for safe measures. Is it ok that the roots are coming out of the pot though? Thank you Brookn for this detailed, step-by-step instruction - this was extremely helpful for a newbie like me . . . great job! This post was very helpful, thanks for sharing! Superthrive is a vitamin, root enhancement concoction. I found some at a local hydroponics store. Some people swear by it, others don't bother with it. I do use it but couldn't tell you whether or not it's helping. It doesn't hurt, so why not. But I wouldn't say it's a necessity. Thanks, Brook! GREAT picture show. This phal has wonderful, healthy roots, not how mine look after they've bloomed, for the most part. When I repot, my Orks tend to go through a peaked period, and some don't last at all. The "bargain"ones, mostly, although it's fun to rescue them. Thanks alot for this, very helpful! Hi Ya'll, And am really new at this orchid business. I have a problem with my Phalaeos!! I have eight of them and they are so beautiful!! This is a common mistake...., sorry. 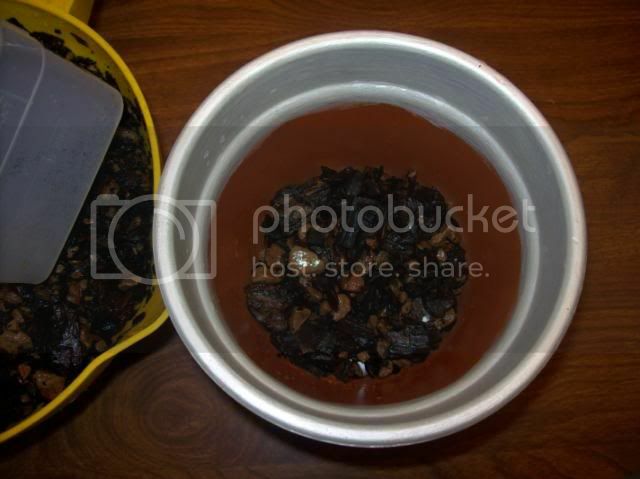 You absolulety MUST soak the bark mix for at least 24 hours before repotting. 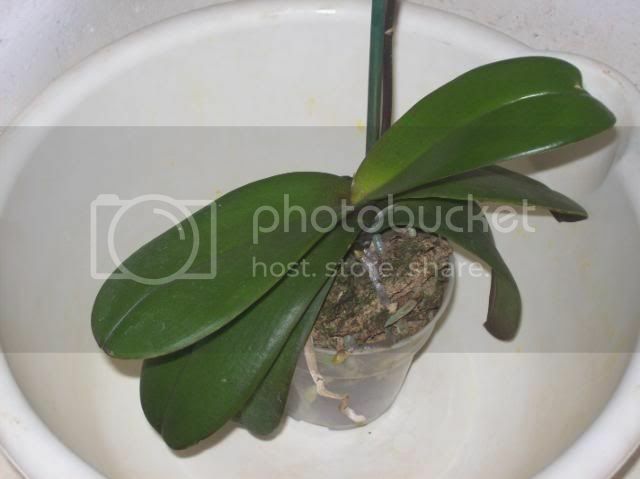 I would suggest to water your phals more often right now (2-3 times a day maybe), while you soak some more mix for 24-48 hours. How much hydrogen peroxide we have to use? 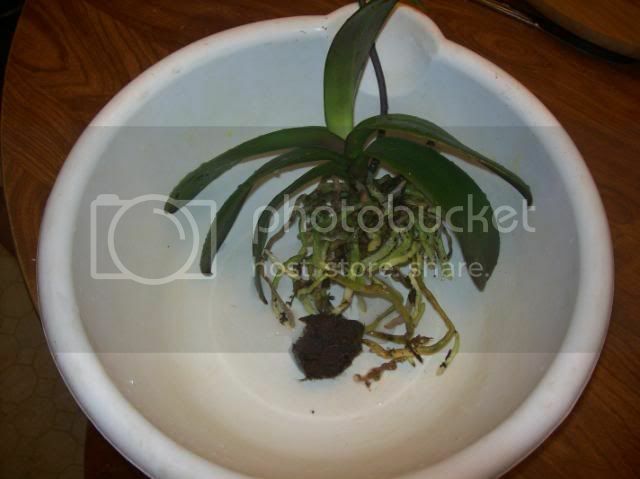 Are we mixed the peroxide with water and let the Orchid sits in the big container for couple hours? Thanks!